Our world is a strange place. No sooner do we feel we’ve come to grips with it than it starts throwing weird fireballs or creepy rock formations our way, and freaks us out all over again. Go looking in the right place and you might even find something as unexpected or bizarre as the following. Far out in the dry and dusty plains of Anatolia lies one of Turkey’s biggest tourist draws: Cappadocia. A UNESCO World Heritage site of ancient rock homes, underground churches, and Byzantine art, it’s probably one of the most historically important areas in the Middle East. So, it’s kind of strange to discover it’s also home to a forest of gigantic stone dildos. You read that right. Thanks to a long history of geological upheaval, rocks around the little town of Goreme have fashioned themselves into all kinds of weird shapes. Nowhere have these shapes been weirder than in Love Valley. Sticking straight up into the sky, and crowned with slightly conical bulges at the top, the rocks here look more or less exactly like Ron Jeremy’s junk on steroids. The entire valley is full of them—enormous stone wangs, stretching off into the distance as far as the eye can see. Unsurprisingly, the area is now a favorite destination for European frat boys to go and take amusingly suggestive photos. Ask a kid to draw you a radioactive pool, and you’ll probably wind up with something like the Devil’s Bath in New Zealand. 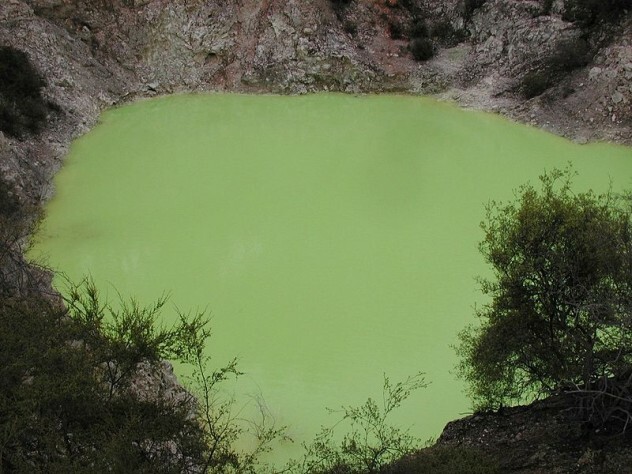 A small lake in the Taupo Volcanic Zone near Rotorua, the pool is filled with water that glows a bright and unnatural green. Since this is a volcanic zone, you can probably guess what causes the Bath’s unnatural color. The whole thing sits over vast deposits of sulfur that break off and float to the top, giving the surface its distinctive hue. This ensures the stagnant waters never look like anything other than radioactive slime. It also ensures they stink to high heaven. In fact, the whole zone has such a thick, rotten egg smell that even guidebooks have compared the atmosphere to walking into the aftermath of a gigantic, infernal fart. The Devil’s Bath isn’t the only lake on Earth to achieve such a deep green color. Tiwu Nuwa Muri Koo Fai in Indonesia also looks like a secret nuclear dumping site. The last place on Earth you’d expect to find anything is the Libyan desert. The most inhospitable part of the already inhospitable Sahara, it’s the sort of place where you can expect to encounter sand, rock, and nothing else. 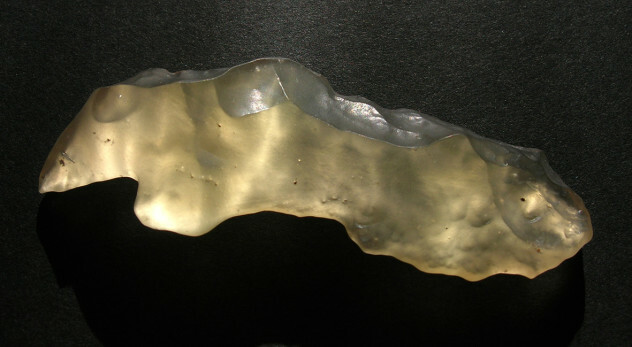 But go to one specific area and start digging in the sand, and you might well find one of the region’s most mysterious artifacts: Libyan glass. Large lumps of yellow silica, this glass has been confounding locals for millennia. The Aterian people used it to make tools and weapons. The Ancient Egyptians made elaborate jewelry from it. In the 1930s, the first Western explorers stumbled across it and tried to figure out what could possibly have caused it. Today, it’s widely assumed that the glass was created by a long-ago meteor or comet crash superheating the sand to around 2,000 degrees Celsius (3,600° F). What the glassy desert must’ve looked like in the minutes immediately following the impact we can only imagine. Tucked away in a small barn in Austria, the Weltmaschine (World Machine) may be one of the oddest projects undertaken in human history. A whirring, brightly colored collection of interlocking spokes, wheels, and gizmos, it was built by Franz Gsellmann over the course of 20 years for reasons that no one can explain. In 1958, Gsellmann—a poor farmer’s son with no training in engineering or mechanics—saw a scale model of an atom at the Brussels World Exposition. Utterly fascinated, he instantly purchased it, returned to Austria, threw everything out of his barn, and placed the model in the very center. And then he began to build. 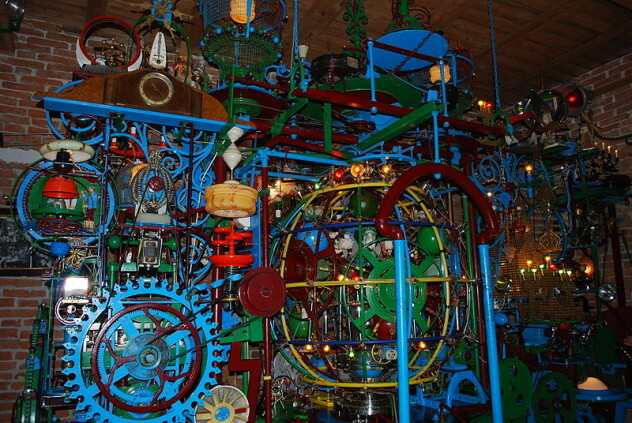 For the next 20 years, Gsellmann secretly constructed his bizarre contraption around the atom model, adding in bells, clocks, fans, conveyor belts, whistles, chains, and even a xylophone. Plastic models of Joseph and Mary, an iron rooster, a spaceship, a tiny windmill, Christmas lights, and a toy gondola were also included, along with a whole heap of other stuff too insane to mention here. He kept the whole thing secret from his family until it was nearly finished. Then, he unexpectedly died without telling anyone what it was for. Today, there are many theories about why Gsellmann dedicated the best part of his life to his crazy machine. Perhaps the most poetic one is that he thought it would reveal the innermost workings of the human soul. Created by human intervention in the 1970s—and named in one of those awful public naming contests—Lake Abraham in Canada doesn’t necessarily sound like the sort of place worth visiting. But make your way there during winter, and you’ll come face-to-face with one of the simultaneously coolest and deadliest natural phenomena in the Americas. 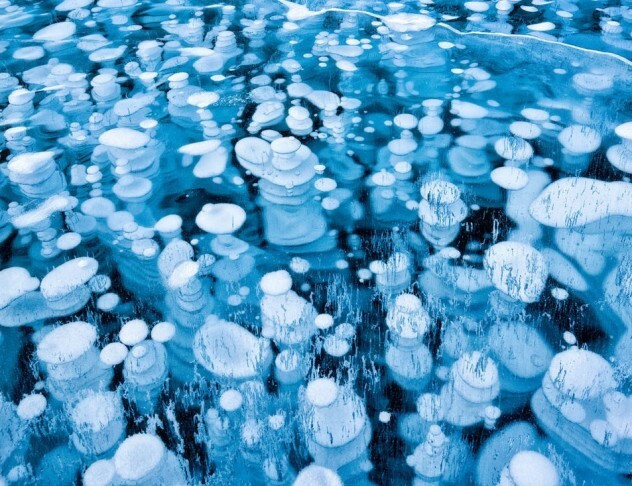 Beneath the frozen surface of the lake, flammable bubbles of methane gas bump up against the ice, just waiting for someone to light a spark and set them off. Caused by bacteria feeding on decaying animal and plant matter, the methane bubbles usually rise to the surface without anyone ever noticing. But, in winter, they turn into white sacks of gas suspended at all sorts of angles in the frozen water. The results are unbelievably awesome towers of bubbles (like those above), trapped beneath the surface of the lake, where any walker can get a clear view of them. This annual show has led to Abraham Lake becoming one of the biggest photography hotspots in Canada. 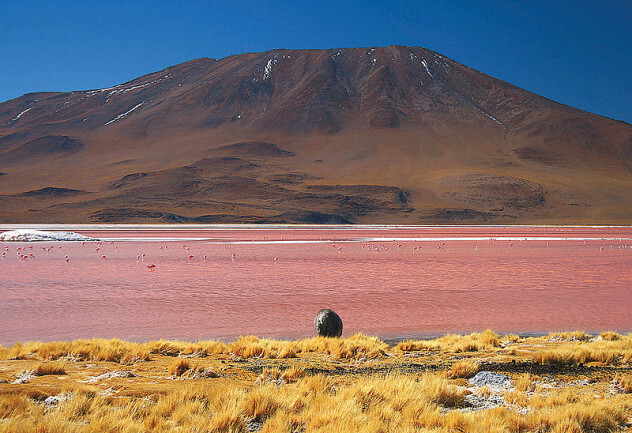 If the Bible had been written in Bolivia, we’d probably assume the guy who wrote the seas of blood section had visited Laguna Colorada. Looking to all the world like the aftermath of a bloody, Django Unchained–style shootout, this high-altitude lake appears to be comprised of one ingredient only: blood. The lake is actually home to a particular species of red algae. Along with a whole lot of red sediment that gets pulled up from the bottom, it’s this algae that stains the water its lurid, horror movie color. The mechanism is similar to the one that powers the similarly beautiful Cano Cristales in Colombia, but instead of blooming only once every 12 months, Laguna Colorada is bright red year-round. Interestingly, Bolivia isn’t the only country to have such a vibrantly colored lake. Lake Retba in Senegal is a bright, bubble gum pink thanks to the excessive salt levels in the water. What comes to your mind when you hear the word “mosque”? If you’re anything like us, you’re probably picturing something like Istanbul’s famous Blue Mosque—a grand solemn place designed for pious reflection. All of which serves to make the Shah Cheragh mosque in Shiraz, Iran even more unique. The Shah Cheragh looks like the inside of an exploding disco ball. The reason for this colorful decor is an odd enough tale in itself. In the early ninth century, two brothers were murdered on the spot as part of the anti-Shiite persecutions spreading across the region. Their deaths were more or less forgotten for the next 500 years, until Queen Tashi Khatun decided to build a mosque by their tombs, turning them into a pilgrimage spot. 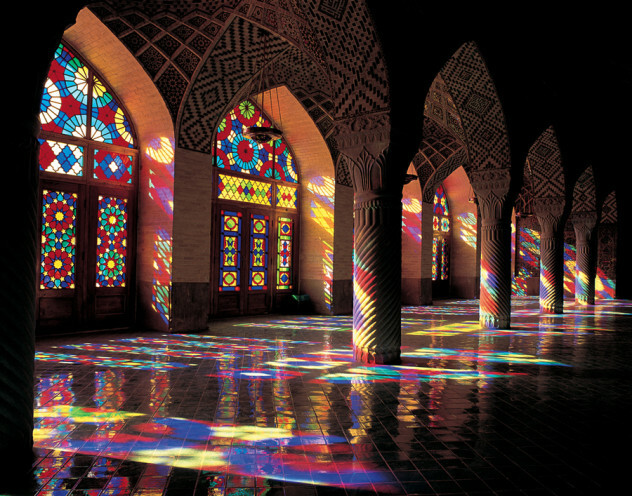 Then, she ordered the mosque be covered in glass to magnify its brilliance a thousand times. As we’ve mentioned once or twice before, rainbows are seriously awesome. But there are other varieties of bows out there that are even more beautiful than the legendary double rainbow. Perhaps the rarest and most haunting of all of them is the fog bow. 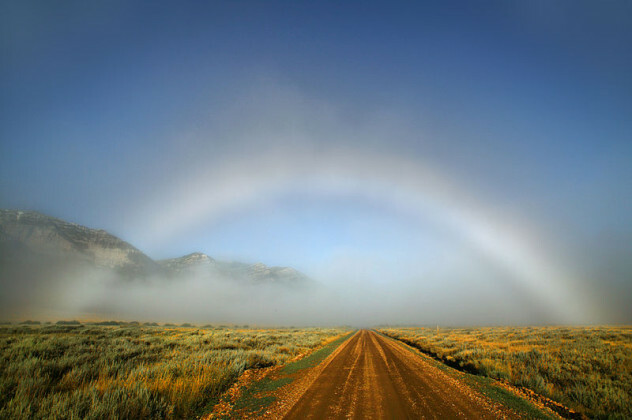 A form of rainbow that only appears in mist or fog (duh), fog bows typically look less like an actual rainbow than the ghost of one that’s recently been murdered and come back to haunt you. Pale, white, and ethereal, they often appear completely unreal—like an illusion made of smoke. The mechanism behind them is exactly the same as the one that gives us rainbows. The difference is that, while rainbows are caused by light refracting through large droplets of water, fog bows are caused by light diffracting through incredibly fine drops. This gives them a pale light which, combined with the fog around them, means most fog bows take on an incredibly ghostly quality. Even when you’ve been doing this sort of thing as long as we have, there are still occasional moments when you come across something so bizarre, so utterly beyond the scope of day-to-day experience, that you nearly run out of words. The dead horse driver of Nevada is one of those moments. Situated beside an isolated road leading out of the semi-derelict town of Baker, Nevada, the dead horse driver is exactly what it sounds like. 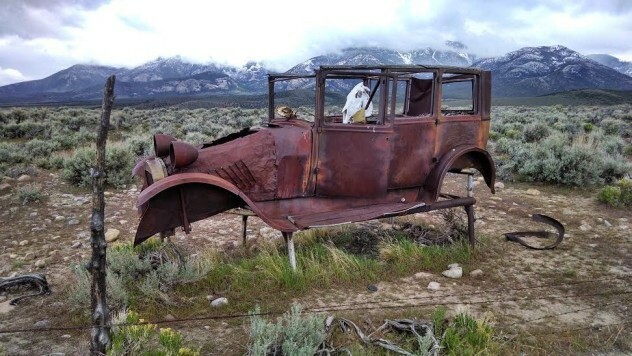 A horse’s skeleton sits propped up behind the wheel of a rusting antique car, its hoof resting casually on the dashboard. It’s clearly just a case of someone living in a small and empty town with way too much time on their hands (although others have suggested it might be an art project). But, seeing it for the first time, it’s almost impossible not to imagine the horse was just out for a cruise and simply pulled over to admire the view. You’re probably aware that we only ever see the very top of icebergs. Over 90 percent of their mass floats along silently, underneath the water, rarely ever noticed by human eyes. Unless, that is, you’re lucky enough to be in the vicinity of one that flips. Well, we say “lucky.” An iceberg flipping over is really quite a dangerous affair. Usually, it happens just after it has calved into the water, and gravity hasn’t quite yet got the hang of which bit should be on the bottom. When a large iceberg does flip, it’s thought to release around as much energy as an atomic bomb going off, and can easily swamp even the largest ocean vessel. But, if you manage to survive all that, you’ll be treated to a pleasant surprise because the underside of an iceberg can be beautiful. 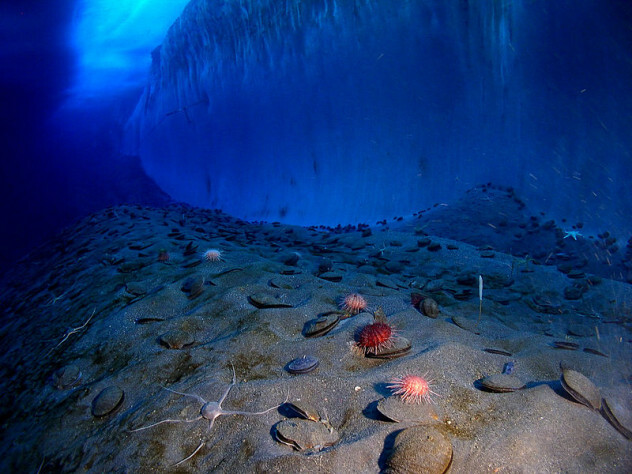 Without a layer of snow covering it, an iceberg’s underside can appear vibrantly painfully blue. This is because it absorbs light at the red end of the spectrum, meaning the ice itself seems to glow brilliant blue. The result is like something out of a science fiction film, and—like so many of the hidden wonders in our world—amazingly beautiful, too.